Have you ever had a terrible cold? A case of the flu, or sniffles so bad, you thought you just might die? That's what Bear is experiencing, and when his irrepressibly cheerful friend Mouse comes to visit, Bear's not certain that Mouse appreciates the gravity of the situation! Despite Mouse's best efforts to comfort him (reading bedtime stories, singing songs, even playing the banjo) Bear is having none of it. 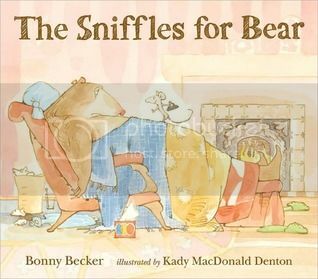 When Bear starts melodramatically reading his will, with Mouse helpfully reminding him of material goods he might have omitted, and cheering over the thought of inheriting Bear's favorite pair of roller skates, Bear roars, "Have you no decency?" and promptly passes out, snoring the whole time. Soon enough, Bear is right as rain... but his poor caretaker, Mouse, has come down with the illness. Fortunately, Mouse appears to be bearing up a little better while under the weather than certain folks we could mention. Watercolor, ink and gouche illustrations in softly rendered tones lend a certain kind of dignity to the over-the-top Bear and his tiny but effervescent friend Mouse. This gently humorous tale will suit preschoolers through second graders just fine.